Why documentary style? First, these videos are perceived as more credible. They aren’t primarily promotional, nor are they scripted. They use the voices of project beneficiaries who talk about their impressions and experiences. These testimonials, as a result, are more enduring. Whether your target audience watches these stories this month or next year, they find them informative and memorable. Ultimately, this makes for a cost-effective communications investment that builds your brand over time. Second, documentary-style videos are a great tool for organizations that are trying to be accountable and transparent to their stakeholders. If USAID is running a project in Lebanon or USDA is funding a program in Afghanistan, should they interview an executive in a Washington, D.C. office or actually show the project where it is being administered? Ultimately, federal agencies are accountable to citizens, and videos are a great way to share information in an accessible way. You don’t need an Act of Congress to create a quality documentary-style video. Just a professional crew from Dorst MediaWorks. Here are 21 great videos produced by Dorst MediaWorks for USAID, USDA, and MCC during the past few years. You should have no trouble getting inspired to make a documentary-style video part of your marketing strategy. This is the story of USAID’s efforts to spur Haiti’s private sector. We see through the eyes of one factory employee, Hermine, who is one step closer to her dream of owning her a home and providing a solid education for her son. After the war, Afghan farmers — particularly women farmers — were getting virtually no support from the government. This is the story of how the Afghan Ministry of Agriculture improves how it does business, which helps farmers, spurs the economy, and contributes to stability. This is a USDA program named CBCMP (Capacity Building and Change Management) that is uniquely effective. This is the story of Annie’s tragic loss and her new passion. It’s also the story of how the Millennium Challenge Corporation helped Malawian women in river communities develop new economic opportunities that protect the rivers that power 90% of the country’s electricity. USAID and the Global Shea Alliance help 16 million women from 21 African countries to collect, harvest and sell shea products around the world. By linking these communities to the global market, USAID helps families engage in international trade and earn a reliable source of income — helping their countries on their journey to self-reliance. This video highlights the work Rita Dampson does with shea collectors and processors in rural Ghana. This is the story of Sara, a fashion designer from Ethiopia. Not long ago, she had 7 employees and only served the local market. Today she has more than 400 employees and her designs appear in major retailers such as J. Crew. This is the story of Mary’s new business and her improved quality of life. It’s also the story of how the Millennium Challenge Corporation helped Malawian women in river communities develop new economic opportunities that also protect the rivers that power 90% of the country’s electricity. This is the story of a transformation. After the war, the Afghanistan Ministry of Agriculture is in disarray. Staff stand in line for an hour to sign in for work (if they come at all) and accounts maintain paper records. Through a USDA program named CBCMP (Capacity Building and Change Management) the Ministry sees a lot of improvements. This is the story of Hala, who had a passion for flower arranging and used to dream of starting her own business. And the microfinance institution Vitas, which is extending loans to women entrepreneurs in Lebanon for the first time. This is the story of Mohammed, who moves back to Ethiopia after 18 years in the U.S. to open a textile factory. The problem is, he doesn’t have much experience, or any buyers. It’s also the story of USAID, whose initial support gives Mohammed just the market exposure he needs to rapidly expand his business. This is the story of Judith and Alice’s new business and their improved quality of life. It’s also the story of how the Millennium Challenge Corporation helped Malawian women in river communities develop new economic opportunities that also protect the rivers that power 90% of the country’s electricity. With more than 9,000 staff and tens of millions of dollars of new donor investments, the Afghan Ministry of Agriculture needed a way to track its assets. This is the story of a USDA program named CBCMP (Capacity Building and Change Management) that helped them do it. Since 1964, IESC has worked in 130 countries and helped to create or save over 1.5 million jobs. This is the story of Malawi’s power sector reforms and how it is spurring economic growth and poverty reduction by by improving the availability, reliability and quality of the power supply. This is the story of Dr. Jaqob, who is the director of human resources at the 9,000 member Ministry of Agriculture in Afghanistan. After working for 10 years with various international donors and NGOs, he shares why a USDA program named CBCMP (Capacity Building and Change Management) is uniquely effective. Since 1964, IESC has worked in 130 countries and helped to create or save over 1.5 million jobs. This is the story of Herschel Weeks, an American aid worker who has led projects in challenging places around the world for the past 25 years. As Chief of Party for a USDA program named CBCMP (Capacity Building and Change Management) Herschel shares why he thinks this is the most successful project he’s ever worked on. This is the story of Noor Seddiq, an Afghan national who after 25 years living in the U.S. has returned to help rebuild the country. As Deputy Chief of Party for a USDA program named CBCMP (Capacity Building and Change Management) Noor is a bridge between the U.S., program staff (99% of whom are Afghan), and the Ministry of Agriculture and its farmers. This is the story of how the Afghan Ministry of Agriculture improves how it does business, which helps farmers, spurs the economy, and contributes to stability. This is a USDA program named CBCMP (Capacity Building and Change Management) that is uniquely effective. This is the story of Emily’s new business, beekeeping, and her improved quality of life. It’s also the story of how the Millennium Challenge Corporation helped Malawian women in river communities develop new economic opportunities that also protect the rivers that power 90% of the country’s electricity. This is the story of Mohammed, Sarah, and Abebe, three Ethiopian businesspeople who built successful companies exporting to the United States. It’s also the story of USAID, whose advice and exposure was exactly what these business owners needed. This is the story of Samir, who almost gives up cattle farming before finally building a thriving business. And the microfinance institution Emkan, which is extending loans to fishermen and farmers in Lebanon for the first time. This is the story of Abebe, who owns a shoe company in Ethiopia. Working with USAID, can he break into the massive U.S. market? Dorst MediaWorks, Inc is centrally located in Washington DC, a few minutes from the DC Convention Center and the Mt. Vernon Square metro station, conveniently located on the green and yellow lines. We’re a short walk or Uber ride from dozens of US Government buildings. Here in Washington, DC, we have a lot of smart people working to make a difference in international development, and a cluster of global nonprofits, USAID subcontractors, and multilaterals. With all this competition, it can be tough for you—a communications professional—to get the word out about your organization’s results. As the founding producer of Dorst MediaWorks, I’ve specialized in video production for international development organizations since 2003. My primary counterparts are Directors of Communications, and we spend a lot of time brainstorming how to tell great stories. Here are six international development videos that have animated our conversations and inspired us. Use the comments below to critique these choices, or add your own favorites! Hands down the best video about the Syrian refugee crisis you’ll ever watch. It’s even better than its predecessor, “Most Shocking Second a Day,” whose message clearly struck a chord: “Just because it isn’t happening here, doesn’t mean it isn’t happening” (and surpassed 55 million views!). Maybe it gets to me because I’m a parent, with a daughter. But that’s the point: it brings the crisis home. The protagonist is our daughter, our neighbor. Emotionally, you can’t dismiss her, particularly given how it’s filmed, with her experience so front-center. Knowing that, Save the Children emphasizes via the YouTube description: “The refugee crisis isn’t just a story on the news – it’s happening here and it’s happening now. Please watch and share.” Moreover, at the 01:30 mark, an annotation reminds us to donate via text. Spectacular strategy, well-executed video, with a wraparound fundraising campaign. This is as good as it gets. The most entertaining microfinance video you’ll ever dance in your chair to! My face hurts from smiling ear-to-ear! Well-produced, the video has fun music, choreography, and mobile camerawork that takes us to meet hundreds of women beneficiaries of a microfinance project. The message, “We want the same things that you want,” really hits home, making a connection. And their lip-syncing refrain of “It’s not about the money, we just wanna make the world dance,” is a brilliant (and ironic) send-up by the Dutch NGO SYPO. The YouTube description reads, “Every single one of these strong and resourceful women has started a business of her own.” I’m a believer: happy, agents of change, dancing their way into our hearts. That’s results! Immersive storytelling at its finest! Charity: Water is known for its successful outreach, so it’s no surprise they give us this. “The Source” is a Virtual Reality (VR) video, so get out your Google Cardboard, or at least watch it in the Chrome browser for the full 360 experience. At one level, this is traditional documentary storytelling: six days in the life of an Ethiopian girl Selam as a water well is constructed in her village. What distinguishes this video is the VR novelty that puts you in the driver’s seat. Scroll around and be part of Selam’s world! You decide what to look at. When these VR videos are done well, I find myself watching them several times, like this one. “The Source” is part of a first wave of immersive VR videos that will only get better as the technology continues to become more accessible and we filmmakers learn how to work in this new medium. I love a lot of things about this video, but here are three things in particular. First, the opening sequence tells the entire story visually in 10 seconds: A boy without an arm throws an object and smiles. Tremendous! No words required. I will never forget that scene. Second, the story structure plays with time to great effect: we start at the pinprick of transformation (Daniel throwing the object), then back to Daniel’s injury, then to Mick’s inspiration, then fast-forward to Mick “putting the plan in action” and finally, the breakthrough … where we started. It’s fun, unpredictable, and serves the story well. Third, Mick’s passion and perspective: Without Daniel, there is no transformation and no story. But without Mick, there is no connection. We are Mick. We get inside his head, and can’t help but be in awe of his determination. Unforgettable. That’s true innovation! The video that provoked a Thermidorian reaction! It’s hard to understate the widespread influence this video had, the allegiance it inspired—and when the pendulum swung back—the hate. Love it or hate it, Invisible Children brought Joseph Kony to the national consciousness; it helped shape policy; and it inspired a cohort of college students to think about conflict-affected people in Africa. Not too shabby! This should be on every list for the next generation. It was that influential. 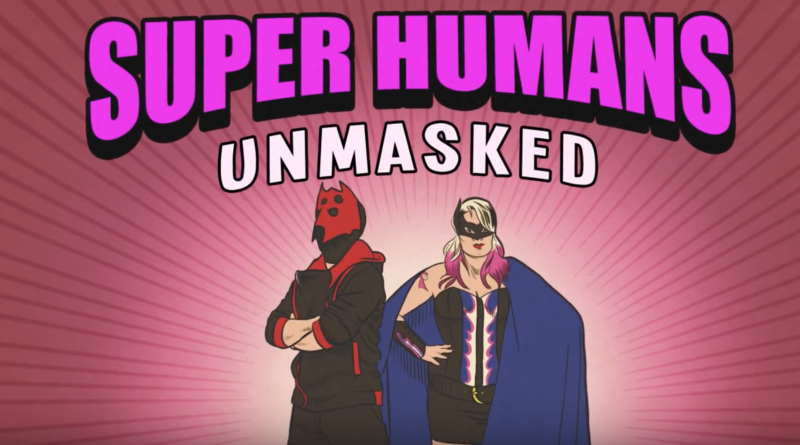 OK, so maybe this one isn’t “epic.” It’s nowhere near as inspiring as “Project Daniel,” tear-jerking as “Shocking,” or entertaining as “Lipdub,” but this video is effective nonetheless. Why? It has one idea and delivers. Visually, it’s strong and memorable. The script is concise, and refreshingly devoid of any wonky insider lingo. Watch it again: it’s all stock footage. It reminds us all that strategy always trumps budget, which is great news for comms departments with shrinking resources. Now that’s epic indeed! So, what do you think? What do you think of these choices? What are your favorites? What’s inspired you? Dorst MediaWorks’ new reel, entitled “Development Stories on Five Continents” is now live on YouTube. It includes clips from 15+ countries where I’ve filmed in recent years—every frame here I’ve either shot myself or directed. These are all videos for international development organizations. It includes my work in Afghanistan, Azerbaijan, Brazil, Colombia, Egypt, Ethiopia, Kenya, Lebanon, Mexico, the Philippines, Zimbabwe, and other places. 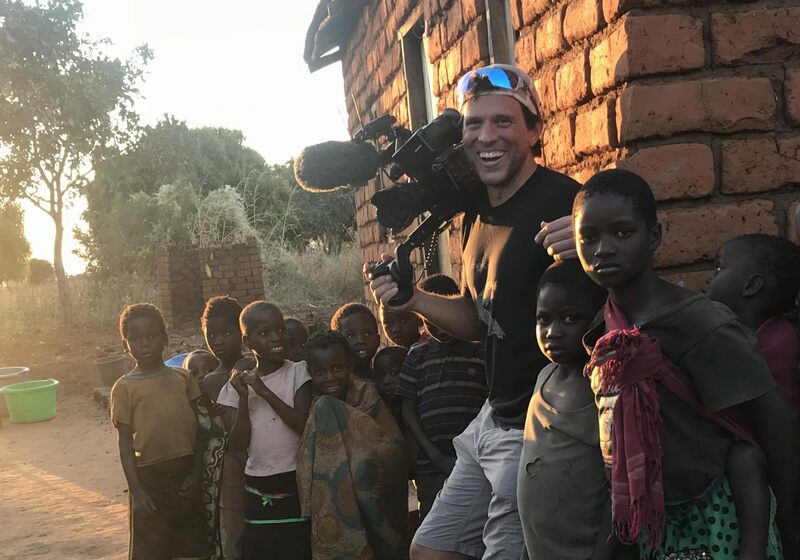 It leads off a playlist called “Dorst MediaWorks Reel: Videos for International Development,” which includes commissioned short documentary films for international humanitarian and development organizations. Visually, it launches with a bombed-out structure in Kabul, followed by a pre-dawn scene in rural Kenya—children are waking. An aspiring hip hop artist strums a guitar on a rooftop in one of Rio de Janeiro’s sprawling favelas. Then a Lebanese fisherman pulls in his catch. Music is Tornado, by Jonsi. Most of these stories are character-based, showing how programs improve the lives of beneficiaries. My clients include USAID and its implementing partners, the World Bank Group and its partners, and other international development organizations. For Rabih in Lebanon, Sara in Ethiopia, and Kinote in Kenya, their fortunes have changed. If you have time, stick around until the end of the 2:50 clip. There’s a graphic that lets you click into 15 of the videos you see here. You’ll hear the voices of Rabih, Sara, Kinote, and dozens of other people — in their own languages, including Arabic, Urdu, Spanish, French, Portuguese, Swahili, Tagalog, Amharic, Meru, and Shona. 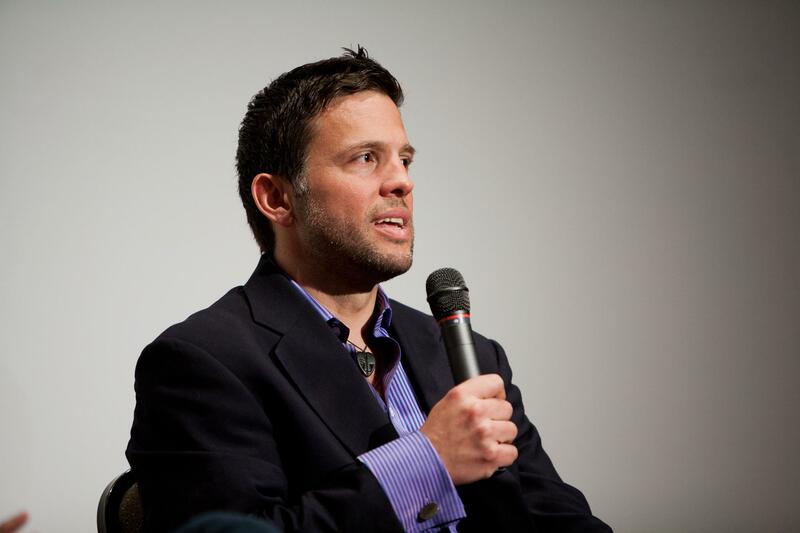 Dorst MediaWorks’ goal is to help make the world a more just and equal place. We make videos for international development organizations that show how international development programs transform lives. This gives greater voice to the world’s poor and strengthens the entities that work with them. For a post on the background and reflection that went into this mission statement, click here. Nairobi’s Westgate mall terror had not yet seized headlines when I left Washington, D.C. to direct and shoot a short documentary there. 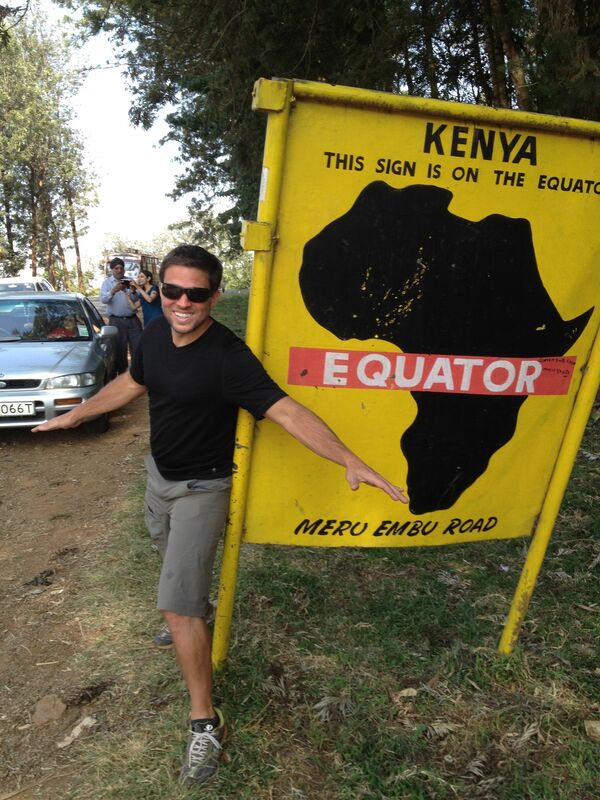 While I’ve been all over central Africa, it was my first time in Kenya. I stayed at the Nairobi Fairmont, which had all the old-world charm of a century-old safari hotel, as well as a dash of unsettling colonial vibe. The DC-based World Bank Group has sent me to a lot of countries in the past few years to document what it’s doing on the ground. You can take issue with how successful the institution’s been in some countries or some sectors, but I like what I’ve seen. Lately, I’ve been serving as director, shooter, editor — and I’ll usually work with a DC-based producer and a unit producer in the field. This time, it’s the Inclusive Business unit of the IFC, or International Finance Corporation—that has me in Meru, Kenya on a coffee farm. When we get there, our coffee farmer is nowhere to be found. We scramble to find a replacement. Soon, I find myself filming a day in the life of Cyrus Kinote, his wife Rhoda Nkirote, and their two darling children. Sometimes, the craziness just overtakes you . . . I direct and shoot, and enjoy working with IFC producer Marcus Watson, who has a good eye. I know this will be more believable if we let Kinote tell his own story, documentary style. I also want the visuals to show his agency and dynamism. So many development videos are bad because they have top-down narration and don’t really give space for the voices of the poor. I resolve to do better. 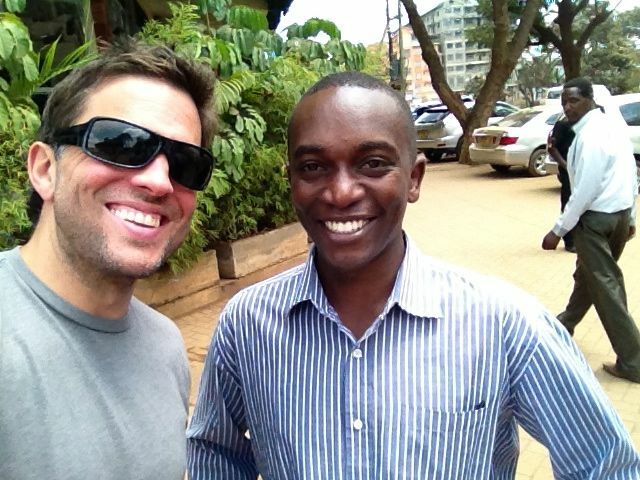 Today, I want to film how Kinote earns a living, spends time with his family, and collaborates with his colleagues. I want to do it all from his point of view. In so doing, I hope the viewer might empathize with Kinote, and care that his life has improved. Today, I want to film how Kinote earns a living, spends time with his family, and collaborates with his colleagues. I want to do it all from his point of view. They say that working with animals or children can double production time. On Kinote’s farm, this definitely holds true. Kinote’s cows are lowing like it’s their job, perpetually interrupting the master interview! Finally, Kinote throws some extra food in the stall, and we buy ourselves a window of time. 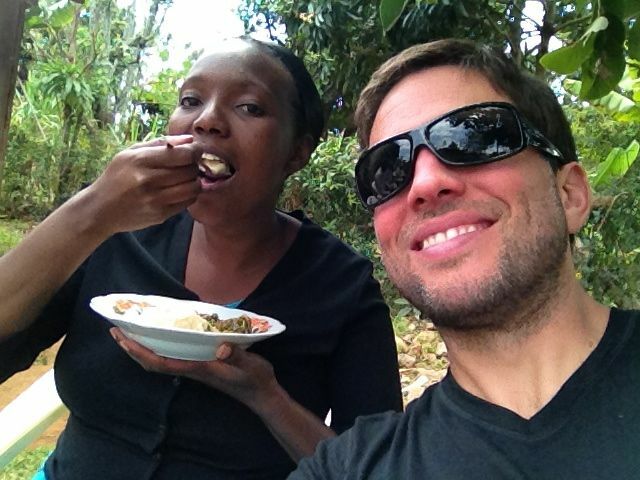 Rose Moseti is a stellar unit producer (sorry for the eating pic, Rose!). She works for Camerapix, Kenya’s best video production company: http://www.camerapix.com . 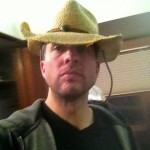 . . Below, Marcus Watson is a fun producer to work with. 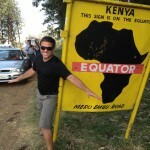 He’s since left the IFC to take a job in Kenya. Late in the day, I film a series of shots with the GoPro, where I affix the little POV camera all over the place: in a coffee tree, a pile of coffee berries, and a wheelbarrow—even around Kinote’s chest. The end result appears as a short montage starting at 2:29. We did the interview in Kinote’s native Kikuyu. Back in Washington, DC, I edit the story and dub in English. It turns out that the IFC also wants a version to show to some important stakeholders in Tokyo, so I master a second version with Japanese subtitles. For me, it’s a first: from Meru to English to Japanese! I really enjoyed getting to know Anthony Ngugi, who works for Ecom SMS, the outfit that trains all the coffee farmers and gives them market access. 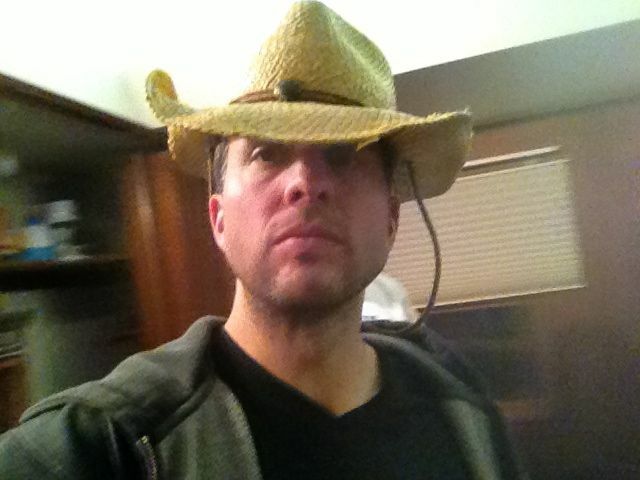 Anthony’s a charismatic guy who seems to relate equally well with the uneducated farmers and the company executives — and comes from a farming background hiimself. Here’s a still from the Japanese version. 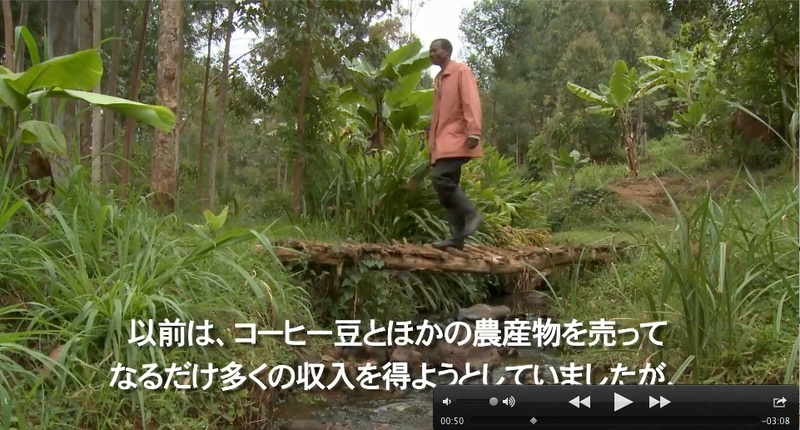 This is Kinote crossing a stream to his coffee fields. Volcanic Sprint on iTunes tomorrow! Seven years ago last month, with both legs dangling out of an old African military helicopter, I trained my film camera down at small dots of racers during the world’s most extreme running race. The participants in the Mt. 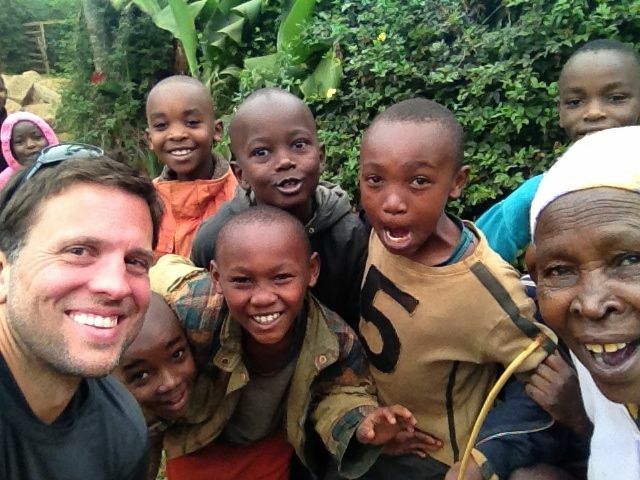 Cameroon Race of Hope still had 25 miles and 10,000 vertical feet to go to reach the roof of West Africa. We screamed up the main drag from Molyko Stadium, spitting up red dirt above thatched-roof huts to Upper Farms with its thousands of joyous fans. It was my first time directing a documentary. I had no cash. 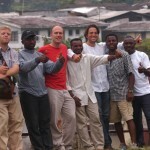 So I put everything on credit cards, hired a knowledgeable DP to head up filming, and then Dan Evans left Washington, DC to fly to Buea, Cameroon. Little did I know that it would go on to do well in film festivals, get distribution around the world, and remain to this day the only documentary that chronicles this extreme running race. If you like documentary films or running, or appreciate projects that are really a wing-and-a-prayer, then spread the word about Volcanic Sprint. Tomorrow, Volcanic Sprint goes live online, with its premiere on iTunes! If you like documentary films or running, or appreciate projects that are really a wing-and-a-prayer, then spread the word about Volcanic Sprint. How can you help? Share the FB post that accompanies this blog post. Rate Volcanic Sprint on IMDB (we don’t have many ratings, and a few boneheads gave us 1 out of 10 ratings, so you can help counteract that . . . if you want!). Shattered Sky on Hulu, iTunes & Amazon! I’m thrilled that Shattered Sky is newly available to watch on Hulu! 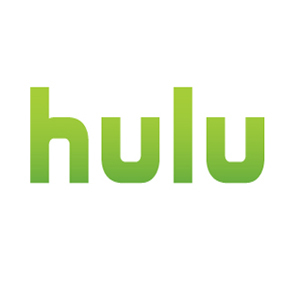 If you have Hulu, it’s free. Just click here. Let me know what you think! The film is also available for purchase or rental on iTunes and Amazon. And if you need a social-issue break from video games, check it out on Playstation! Thanks to the big Facebook community for spreading the word. December was the best month for downloads yet. Thanks! 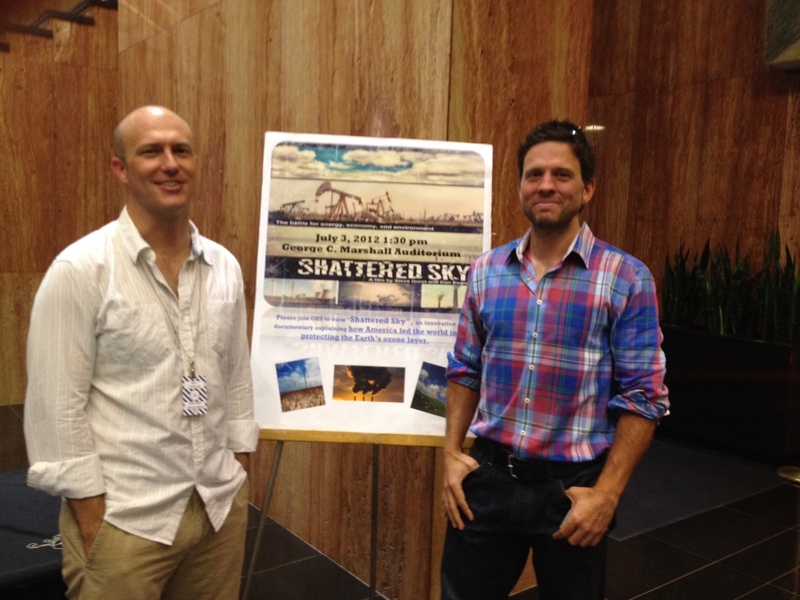 Shattered Sky tells the story of how America led to solve the biggest environmental crisis the world had ever seen. It challenges us all to do the same on climate change today. If you want, pass it on — tell a friend or two about my movie — hopefully more of us can have a can-do spirit about solving climate change. 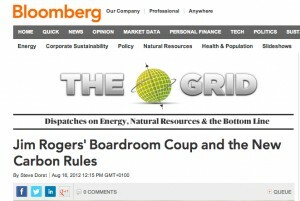 I wanted to share a great follow-up to my Bloomberg article last week. 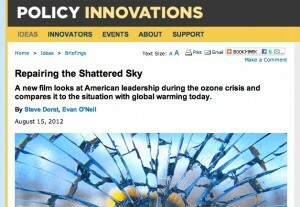 Policy Innovations, a publication of the Carnegie Council, ran a Q&A with me entitled Repairing the Shattered Sky. Editor Evan O’Neil asked some tough questions. I call climate negotiations “medieval trade fairs” and US politicians “cowards.” I hope you have a chance to read it! It was good fun, particularly thinking about the film and the issues it raises through Carnegie’s lens: ethics. China came up a lot. The moral and practical responsibility of Americans to act on climate change came up as well. Hope you can read it! Pretty excited today. An article I wrote got picked up by Bloomberg. 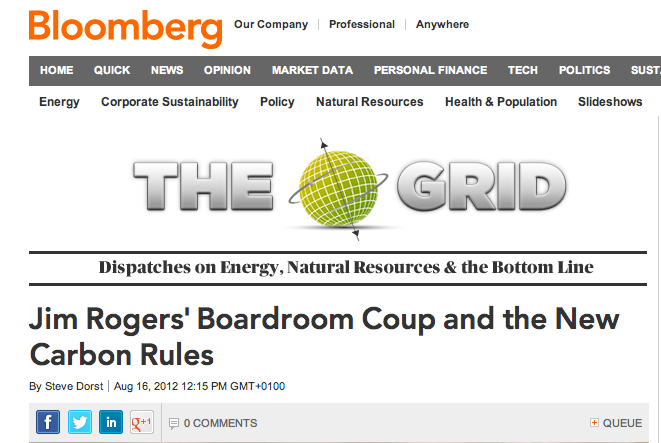 It’s in Bloomberg’s Sustainability blog, “The Grid.” It’s about my experience interviewing Jim Rogers — the CEO of America’s largest coal utility — for Shattered Sky. About the lessons of the ozone issue, through the eyes of America’s most powerful coal executive. Today is also the second day of the Shattered Sky Kickstarter campaign. It’s been an incredible response, with $9,200 given, by 54 backers in the first day. It’s not easy launching a project to raise $35,000, but it sures allays some fears when you raise 25% in the first 24 hours. 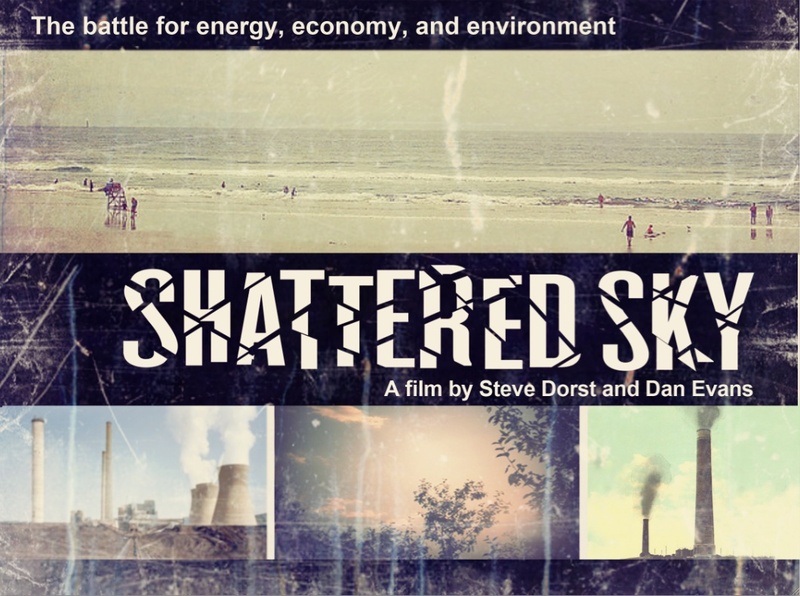 If I reach my Kickstarter goal, Shattered Sky’s distribution will be great: festivals, promotion around the PBS TV distribution, and Facebook contests and other initiatives to accompany grassroots events. Here’s my first Kickstarter update. I’m also encouraged by the progress on the petition, which I’m conducting with Shattered Sky’s advocacy partner, Care2. More than 4,400 people have now signed it, demanding that candidates Obama and Romney pay more attention to climate and energy issues in their election runs. Less than three months to go until the nationwide public TV premiere of Shattered Sky. I’m excited about the chance to make a difference. I’m hoping enough people get wind of the film and get inspired that our country led the world during the ozone crisis. Then we can all look at the challenges posed by climate change through a new lens — why not work together? Why not set aside short-term differences? Why not unite to lead the world on renewable energy? How can this NOT be a good strategy for jobs and the economy — the rest of the world licensing our clean-tech inventions for the next century? If Ronald Reagan’s cabinet thought that strong action on the global ozone treaty was a good thing, why can’t our politicians today find a way to work together on the issues that affect our economy and environment? Maybe we as citizens aren’t doing enough to work together. I aim to change that. And passing 500,000 fans on Facebook this past week reminded me that there are a lot of people out there who share this vision. Working toward the September public TV release and campaign launch, I know we can really make a difference together! 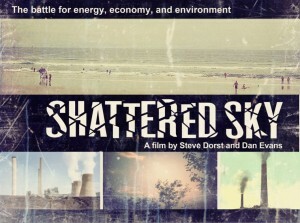 Shattered Sky – Can We Do the Same on Climate and Energy? Been super busy, in a good way, in post-production for Shattered Sky. New feature indie doc from my co-director Dan Evans and me. 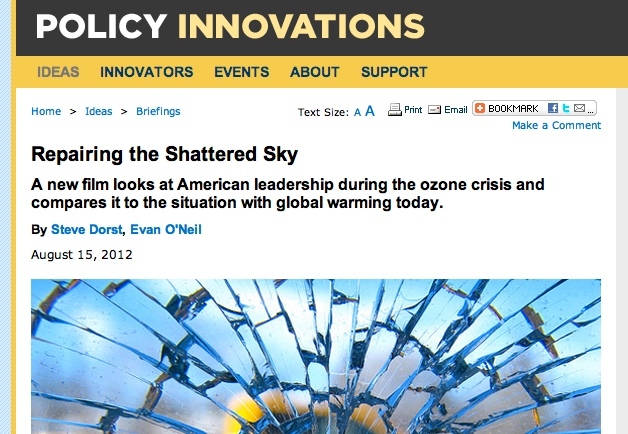 Compares ozone issue to the current climate/energy crisis. Amazing similarities between the two: invisible compound was found to be wreaking devastating effects on the environment; all countries were at risk; changing course meant massive global economic implications; finding a solution was incredibly tough . . . except in the case of the ozone issue, the US took responsibility, owned up to the issue, led the world to a solution. It wasn’t perfect, but it worked. Can we do the same today on climate and energy? This past month, Volcanic Sprint has sold to Al Jazeera (to be subtitled in Arabic and played throughout the Middle East, Outdoor Life Network in Canada, and a program in Japan. 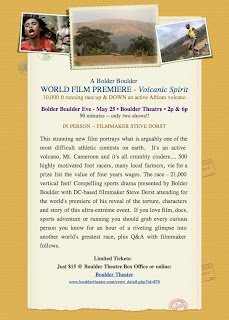 Two showings of Volcanic Sprint today at the Boulder Theater. A shade over 200 people came out, and the Q&A’s were awesome — a credit to Boulder’s running community, some of whom even signed up to run the Mt. Cameroon Race next year! Craig Mintzlaff wrangled up a half dozen sponsors; and Danny Abshire, head of Newton Running came to both showings, and said some kind things about the film. We collected dozens of pairs of near-new running shoes for Michael Sandrock’s nonprofit One World Running. Good show Boulder! 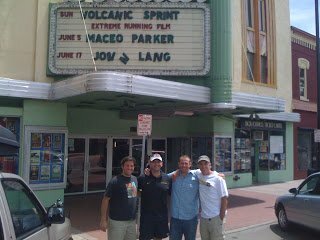 Outside Boulder’s historic theater, on the left with the guys that made it happen: mover and shaker Craig Mintzlaff, principal of Endurance Sports Marketing; Justin Perkins, the glue that kept us all together; and Michael Aisner, eclipse chaser, US Cycling Hall-of-Famer, and great all-around guy. Pearl Street Mall. I spend the day hobnobbing and talking to people about the film. Spending so much time with Volcanic Sprint had bred a familiarity that ultimately made the mountain race seem pretty accessible to me. Wow, was I in for a shock! The Mt. Cameroon trail basically goes straight up, through rainforest, savannah, and curling around a 2000 lava flow that reformed the mountain and lengthened the race. The ascent is the most challenging thing I’ve ever done, and just getting my air above 12,000 feet was tough. I can’t imagine for a moment running. The descent was the most painful thing I’ve attempted in a long time. That runners go from summit to base in a little more than an hour is — and I don’t think I’m exaggerating here — one of the most impressive athletic feats I’ve ever witnessed. Check out this clip we recorded from the summit! I decide to cover as much of the race as possible taking photos. 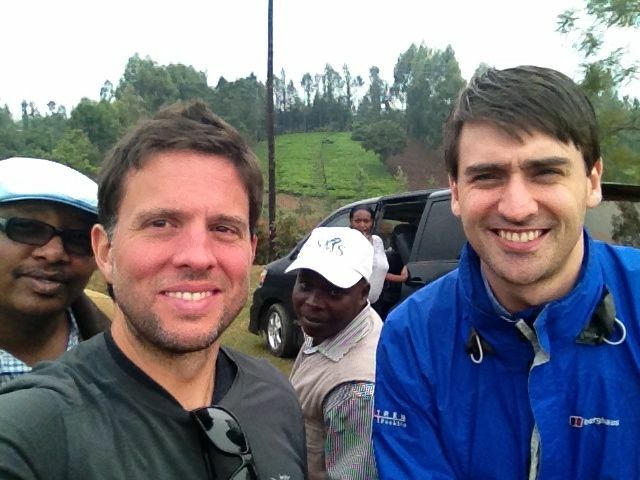 The race starts at 7am at Molyko stadium, and I streak out with the runners to rejoin Hans, my moto driver. We have about 28 minutes to document the 4.5 miles of ascending road until the lead pack hits the trailhead at Upper Farms. Buea’s denizens line the race route in droves. The rising sun is soft, the light refracting over smoky hills. The rounded mountain peak is barely visible. I run, walk, hike, and snap photos along the way. The rainforest is never-ending. It takes the best runners about 35 minutes to traverse the rainforest segment before they confront the even steeper slopes of the savannah. It take me 1 hour 45 minutes. Eventually, I make it to about 7,000 feet, to a little hut between hut 1 and hut 2, then run most of the descent to Upper Farms. I arrive only moments before Sarah Etonge. Then literally thousands of us accompany her down, children, mothers, cars honking, flags waving, and me mounted backwards on an idling motorcycle knowing my privilege to chronicle the Queen’s final race. It’s Saturday, the day before the race. Call time is pre-dawn. It’s a familiar ride in the bed of the pickup up Buea’s main drag, which traverses Mt. Cameroon’s southern slopes. The Queen of the Mountain is just as electric and personable as the day we left her in 2006, when Buea Town unveiled a statue in her honor. She’ll run the race for the final time this year, and hopes the Cameroon Athletic Federation will help her secure a job afterwards. She is, after all, 40 years old. Max informs us he’s not running the race as a way to honor his father, John Ekema who died last month. The tall, dried raffia palms rattle as Max pulls them off his father’s grave, only 15 feet behind Max’s shack. A fading plastic wreath reads “RIP John Ekema,” beside a torn pink plastic sandal (“my father’s favorite shoes”). The site’s volcanic stones are strewn with an offering of feathers and spent red shotgun shells. The late Ekema, besides being the first winner of the Mt Cameroon Race and a subsistence farmer, was an avid hunter. Every time I’m in Douala, I’m amazed it functions, what with the cramped streets overflowing with kinetic traffic, pedestrians, and commerce claiming every patch of level earth. Since my last visit two years ago, the Chinese moto manufacturer Sanili has taken over. Maybe it’s the jet lag, but that 1990 song by Sinead O’Conner, Black Boys on Mopeds, cycles repeatedly in my head. The press screening for Volcanic Sprint takes place at the French Cultural Center. I meet Jean-Marie Mollo Olinga, one of Cameroon’s most notable film critics, who wrote about our film’s premier in Yaounde yesterday. Following the film, Unit Producer Moki Charles joins Dan and I on stage. Soon, the journalists are debating among themselves about the merits and subtleties of our film. . . Next stop, Buea. Off to Buea, Cameroon today for the 2008 Mt Cameroon Race. San Francisco to Atlanta to Paris to Douala. The trip is packed: Friday the Cameroon premier of Volcanic Sprint, at the French Cultural Center in Douala. Saturday, we’ll film Sarah, Max, Walters, and others for some DVD special features. Saturday night is the open-air projection of Volcanic Sprint at Molyko Stadium — free for the whole town. Sunday is the race, where we’ve again hired four cameramen. After the race, I’m participating in the shoe donation — 400 pairs to the top 100 finishers in each of the four categories: men, women, youth, and masters. 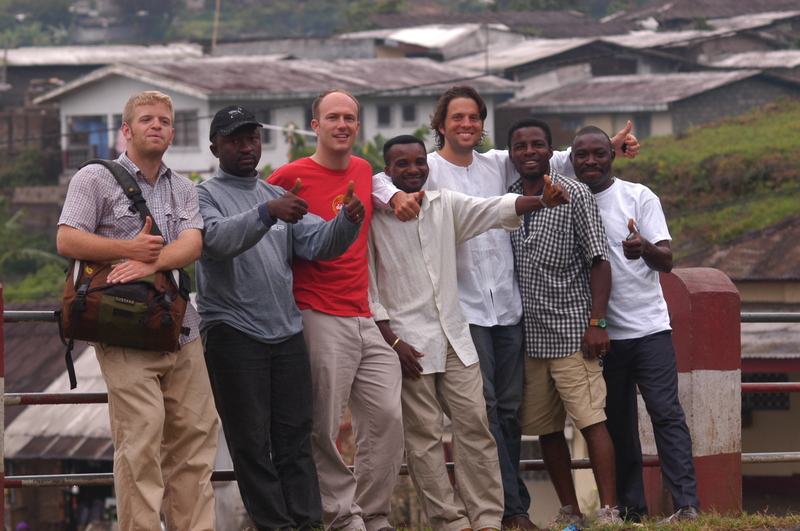 Monday, we’ll do some more follow-up stories, and then say good-bye to Buea. In Boulder Colorado today for a viewing party for VOLCANIC SPRINT at the house of Michael Ainsley. 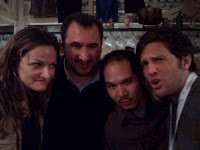 He assembled about 15 of his friends and acquaintances that he thought could offer feedback on our emerging distribution strategy. Elite runners, a famous photographer, TV people, race organizers, executives, and sports entrepreneurs — a great mix. Today, we firmed up an international distribution deal with American Public Television Worldwide for Volcanic Sprint. We’re looking forward to seeing which countries they can license it in.